Started planning yet? Thanksgiving lists have begun, invitations are out and I’m knee deep in recipe testing. Now that it’s November and our jack-o-lanterns have turned to mush, the holidays are officially upon us. That typically means more gatherings with friends, family, and new or old acquaintances. It also means having to remember so much more. This can be a good or a not so good thing. It’s good to exercise our minds and memories as we meet and gather with new and old friends and family. We use different parts of our brain as we engage with others and it’s a way to exercise our brains we cannot do alone. On the other hand, as memory issues slowly or dramatically make their appearance, social gatherings tend to highlight the problem. Often as family and friends, we tend to make excuses for those we love and chalk up memory lapses to many things, least of all an official problem. Now this isn’t if Great Aunt Nellie can’t remember every great niece and nephew. All of us have some trouble with names, and when pressed, it can be difficult to remember everyone’s vital information. But if Aunt Nellie seems to have a hard time remembering even the simplest things, especially her favorite things and people, it may be time to seek some professional help. So often, memory loss occurs for years before anyone seeks help. We explain it away as stress, grief, or old age. All of these can contribute to episodic memory loss. It’s also difficult to point out to our loved ones that their memory doesn’t seem to be what it once was. But the longer we put off the conversation, the more damage is done. The sooner it’s addressed, the sooner treatments and strategies can be implemented to improve memory and quality of life. 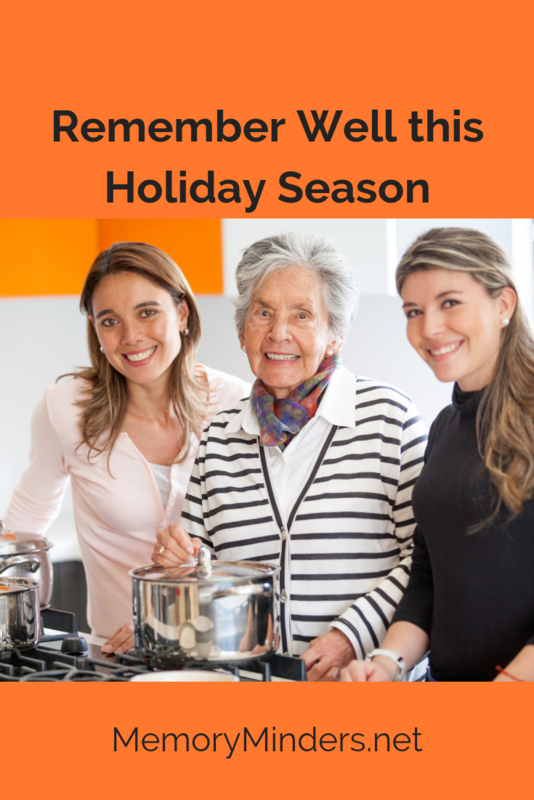 The holidays are busy and paying attention to our elder loved ones can seem like one more thing to do. But one way to truly honor them and their importance in our lives is to really pay attention to their memory and overall wellness. A fantastic resource to review before the holidays is the Know the Ten Signs resource by the Alzheimer’s Association. It can provide some vital background information to have on hand to help anyone with memory challenges. Socializing with those we care about is one of the best parts of the holiday season. Engaging with others stimulates all of our memories and brains in a healthy way. But if any troubling signs are noticed in our loved ones, let’s not hesitate to begin a discussion. Early detection can save precious moments and make them more meaningful and memorable. Habits keep us on track-they help us maintain routine, make things easier and even help us remember better. But when bad habits invade our lives, they can be difficult to change. One of the most important habits we can control that impacts our body and mind wellness is our eating habits. Lately, mine haven’t been the best and now I’m paying the price. Stress, a busy schedule, life events, and let’s just say a bit of laziness has led me to not always make the best food choices lately. It’s a slippery slope and often one not so great choice leads to another and soon weight gain, lack of concentration and overall malaise is the result. What we feed our bodies is what we feed our brains. 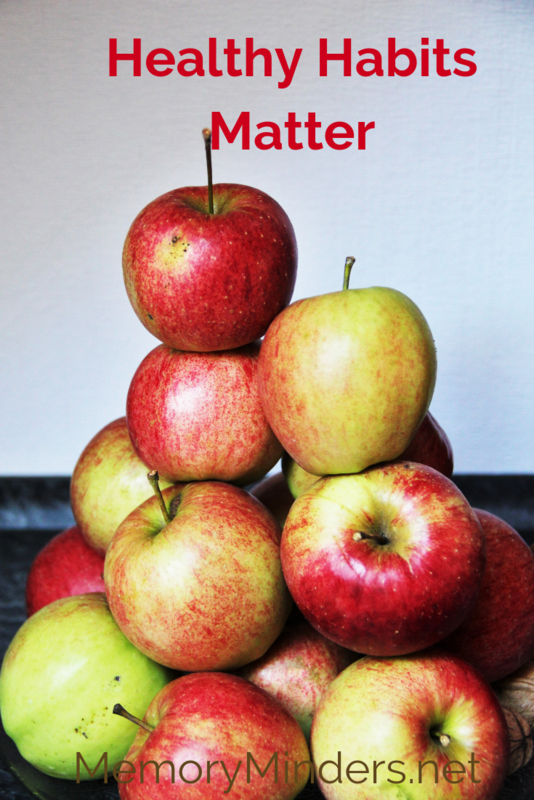 Research has shown those who eat healthier often have better cognitive recall and function as they age. There are a myriad of reasons why this occurs and they probably work in tandem for our overall health. The bottom line is if we eat well, we think better. Many of us know what good food is-fresh, less processed and includes a variety of good fats, proteins and carbohydrates. Yet convenience often trumps healthy. So let’s review some options to make healthy food choices easier to benefit our memory wellness. Fresh and whole over processed. When on the go, this isn’t as simple a choice. But if we can plan ahead a bit, it becomes a bit easier. Stop at the store instead of the drive through. Go to the produce section rather than the frozen food aisle. Often fresh food doesn’t take much more time to prepare than the processed kind. Choosing whole grains over processed gives us more of the beneficial vitamins and fiber. Food stores and buffet lines often have salad or other fresh options right next to the unhealthier options. Choose well. Good fat over not so good fat. Olive oil, less saturated oils like canola or sunflower give us a better option for fats. Butter is a staple in my home too, but when possible swap it out for other healthier options or minimize its usage. Our bodies and brains need fat to function well, but too much of the wrong kind can be detrimental to our wellness. More dark fruits and vegetables! Half our plate with each meal should be fruits and vegetables. Instead of chips or convenience snacks, reach for an apple or some carrots. Add healthy almond butter or hummus and it’s suddenly a much healthier and satisfying snack. Instead of extra potatoes or meat, fill up by eating the veggies first. The healthy antioxidants, vitamins, minerals, and fiber in fresh fruits and vegetables are winners for our brains. Even though we know how to eat well, we often don’t. But in the long run, convenience causes more problems than it solves. I’m going to rededicate myself to eating healthier for my body, brain and overall wellness, using these healthy habits as a guide. Hope you’ll join me! Ahh sleep-refreshing, rejuvenating and elusive? Our heads hit the pillow after a long day and we just want to relax. We collapse, find that comfortable spot and drift to dreamland, right? Wrong. For many people, especially those who are older, sleep becomes more elusive with age. Scientists and the medical community are educating us all on the importance of sleep for our bodies and brains. So how can we sleep well? This generation is trending toward less sleep than many before it. Technology advances, never ending options for entertainment and commerce, fear of missing out, bodily changes as we age, are all reasons to explain why we are sleeping less. 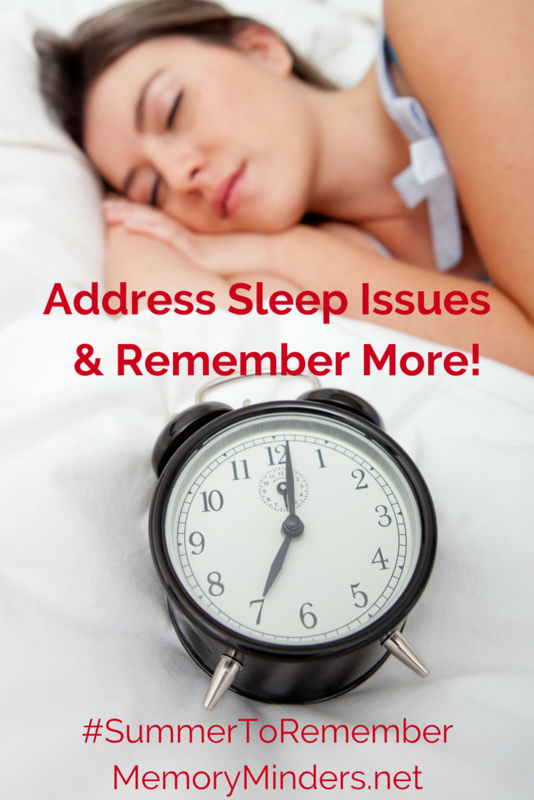 Sleep plays a pivotal role in our body and mind wellness, yet the processes aren’t fully known. One things researchers do know about sleep is that is provides a virtual rewind and organizational component to brain and memory wellness. When we get enough sleep, these brain functions occur naturally and assist memory. When we don’t, things get backed up and just like a messy desk or an overgrown garden, it takes longer to be more efficient in our efforts the next day. We know we need to sleep in order to function well in mind and body, yet our actions don’t always fit our wishes. I’m a perfect example. I need at least seven hours of sleep to function optimally but that is a rare occurrence. Getting up early for school, work or summer events, carving out a bit of quiet time for myself and/or being so used to getting up early I can’t sleep late anymore are a few of the reasons why I often don’t make that seven hour mark. My fitness tracker also monitors my sleep and sometimes I catch up a bit on weekends, but my average sleep amount still usually falls short of those refreshing seven. And I feel it. Some days I’m just not physically or mentally sharp due to my lesser sleeping time. Getting to bed and sleep sooner is always a goal and I have made a dent. My bedtime goal is earlier than it used to be. I’ve learned to manage the thoughts that sometimes make falling asleep difficult. I’ve adjusted my diet, our bedroom and our bed to make them more conducive to sleep. My motivation is not only to keep my body refreshed but also my brain and memory. Keep a regular bedtime and wake schedule. Your body will then automatically sense when it’s time to sleep and awaken more naturally. Keep your bedroom about sleep. Don’t exercise, eat, watch TV, scroll the internet or be on any other electronic device before trying to get some sleep. Eliminating these things sets the tone to wind down and relax. Let go of what threatens the drift-off factor. Whether it’s thoughts, worries, moving around, or loud noises adjacent to your bedroom, let them go. Write down or pray about worries or things to do, find a comfy spot and try to stay there and control the noise. These will assist you to drift into dreamland more easily. Control your evening actions. Don’t exercise or eat a big meal. Don’t consume alcohol or caffeine right before bedtime. All of these can interfere with a more natural wind down time in the evenings. Work on what you can and when all else fails, talk to your doctor. There are many things we can control but if you’ve tried them all, see if your doctor has another solution. Maybe it’s adjusting your medications or trying another sleep producing alternative, but seek professional help if necessary. Quality sleep is paramount in our efforts toward wellness in our body and mind. If we truly want to savor these last moments in our #SummerToRemember, we need to get enough sleep. See if these help with your sleep and overall memory and let’s remember our summer moments well! 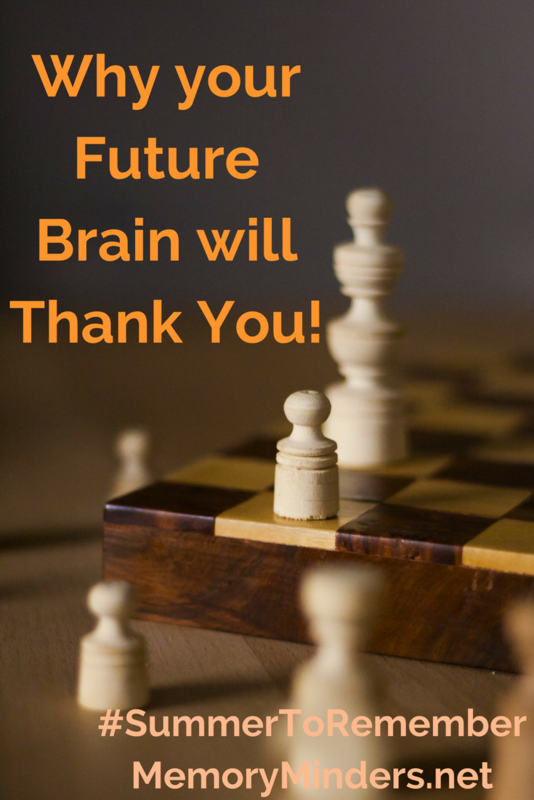 Your Future Brain Will Thank You! We don’t think about exercising our brains as much as our bodies, but we should. In order to age well, we not only need to take care of our bodies, but also pay attention to maintaining our brains, too. Studies have shown those who stay mentally engaged retain cognitive function longer than those who don’t exercise their minds. This week in our #SummerToRemember series, let’s explore ways to stay mentally sharp. How do you exercise your brain? In our middle years, we have numerous mental challenges bombarding our brains all day long. We long for the day when we can physically and mental relax a bit in retirement. But that attitude can lead to golden years of lackluster cognitive function. In order to have sharp minds now AND later, we need to stimulate our minds daily, no matter our age. Retirees may feel they deserve a break-as well they do. However, if we choose to not engage in mentally challenging activities as we age, we will lose the ability to think and function at a high level. It’s the ‘use it or lose it’ adage that applies to both physical and mental ability. When we exercise our brains, we then have more brain power to call upon when needed. It’s that simple. When life shifts into retirement or a different season of life, how can we continue to challenge ourselves? By being creative! Daily life offers a plethora of choices and options to stimulate our minds, but are we capitalizing on them? Whether it’s working, raising a family, juggling both children and parents, caring for grandchildren, or just managing our aging lives, we all have choices. How we choose to spend our time truly matters. Are we engaging mentally in something that stimulates our brains or do we choose easier, more passive ways of spending our days? Are we using our time wisely or taking the path of least resistance to just get by? What we choose will make a difference in our mental capacity later in life. If we always choose the easy path and don’t challenge ourselves mentally, we’ll have less ability to do so later. Let’s pick the road less travelled as Robert Frost put it. Let’s do simple things like take a different route or figure it out without relying on GPS. Let’s do the math in our head instead of using a calculator. Let’s create a new recipe instead of making the same old thing for dinner. Let’s try a new game, read a different type of book, join a new club or make a new friend. All these simple choices can make a world of difference in how our brain functions now and when we’re older. The added benefit of challenging ourselves mentally is the good feelings it evokes. Trying something new or different feels uncomfortable at first. But after a while, we settle in, find our groove and eventually can take pride in even attempting something outside our box. Endorphins are released and happier, more satisfying feelings result. WIN, WIN, WIN!! Give it whirl. Try something new, step out of your normal routine and stimulate your brain more than usual. Do it today, tomorrow and the next day so your future self will thank you. Make it a #SummerToRemember by challenging yourself mentally! Birthdays, anniversaries, and other circled dates on the calendar remind us of past memories and those yet to be made. Among the routine of every day, special dates give us something to look forward to, to anticipate; a time to make memorable moments. But let’s also not forget how memorable everyday moments can be as well. April in my world brings a plethora of special dates-typically Easter and so many birthdays abound. It’s an opportunity to make special memories around special people and events with importance in our lives. But everyday moments can often bring about the same specialness-if only we are present and aware enough to experience them. Much of memory making comes from being fully present in the moments we want to capture. Younger people have a proclivity to capture anything and everything in a photo or selfie and then broadcast it to the world. While that may be fun and helpful in many ways, if we are only focused on capturing the best picture, we may lose truly seeing and encoding the moment in our memory. A study years ago demonstrated those who take more pictures have a lesser memory of an event. We’d tend to think the opposite was true, but when we fully experience a moment instead of just snapping it onto a camera, we can fully remember it better. Yes, the picture may jog our memory, but really experiencing it encodes it more fully into our memory. For me, it comes down to balance, like most of our memory habits. One of my focuses this year is to strive to be more fully present. 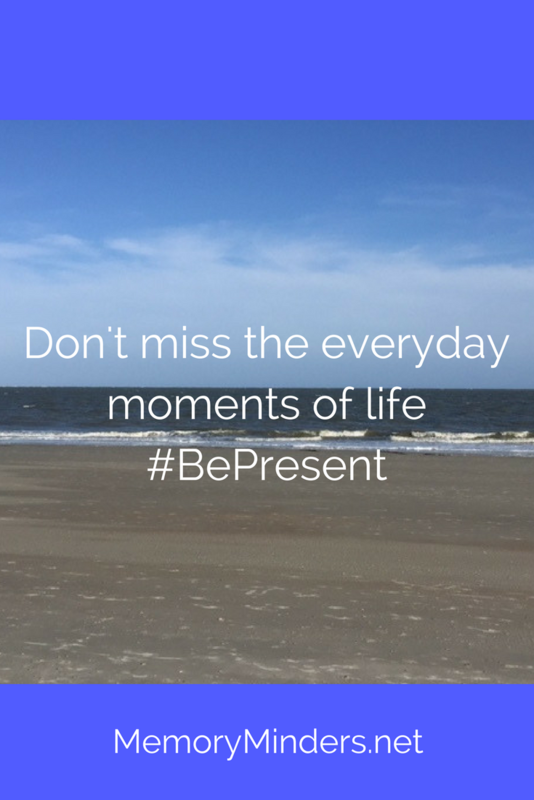 On my other blog, I wrote a series on how I’m trying to #BePresent and am striving toward this in all I do. However, I love photography and my new camera is a new favorite toy. Yet while snapping away recently, I realized how marking a memory comes more than from a picture. It’s about the moment, the people, the feelings and their impact in our lives that matter. Yes, the picture may help evoke a moment, but the memory needs to be made in our hearts and minds first. Just having returned from time away and sharing special days with those I love has reinforced my goal to be even more present in the everyday. Memorable moments stem from both the every day and the special to bind our lives and memories together. Look around today. What people, events, or stolen moments can we truly be present with to experience more fully? How will we remember and how will they shape our days and futures? How can we plan for a special day for ourselves or others that we can circle in anticipation of future memories to be made? Life is full of moments both routine and remarkable. Let’s be present and focus on what is happening in our small little corners of the world today. Circled special days are wonderful to look forward to, but let’s not miss the small moments that make up the fabric of our lives. It’s in these where we make all our moments memorable.